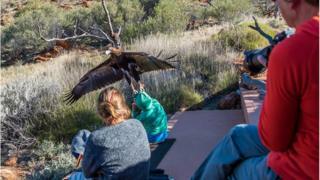 A crowd of stunned onlookers watched the enormous bird latch its talons on to the screaming boy's head during a show at Alice Springs Desert Park. Witnesses said the bird attempted to pick him up "like a small animal". The boy - believed to be between six and eight years old - escaped with a "superficial" gash to his face. Christine O'Connell from Horsham in Victoria state was visiting the park with her husband on 6 July when the attack occurred. "A fellow who was sitting closer said the little boy kept running his zipper up and down," said Mrs O'Connell, who caught the attack on her camera. Distracted by the noise, the eagle grabbed the boy's green hoodie and attempted to lift him away before park staff moved in, Mrs O'Connell said. "We're at the bird show in the afternoon, having a great time and looking forward to seeing the wedge-tailed eagle come out for the finale," he said. "The bird then flew over the crowd and tried to grab on to a young boy's head. He screamed, the mother was distraught and the presenters wrapped up the show very quickly." The park issued a statement to the media after being contacted about the event. "On Wednesday, 6 July, an incident occurred at the Alice Springs Desert Park where an eagle made contact with an audience member," the park said in a statement. "A thorough investigation regarding the circumstances behind this incident is under way and the eagle will be removed from the show while this investigation is ongoing."